This past weekend was Dave’s weekend to have the kids, and even though it was Mother’s Day, we didn’t really feel the need to change it up. I mean, I guess if the girls had been upset about it, we would’ve altered the schedule? But it’s just a day, and it didn’t feel like a huge deal to any of us. The kids both made cards for me, which I got on Friday. 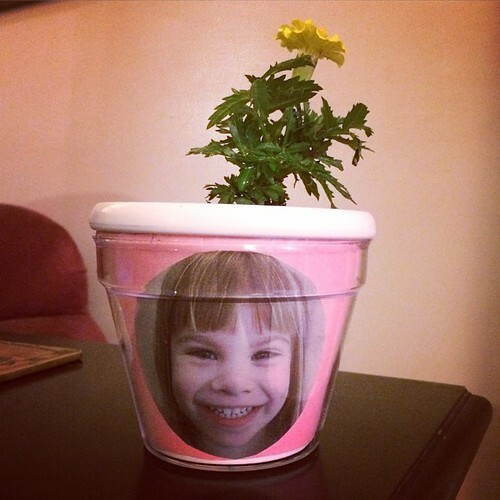 The daycare teachers always come up with some little craft project for Mother’s Day, which is how I got this little flower pot with Lucy’s face on it. I laugh pretty much every time I look at it. So, that was Mother’s Day. I slept late, Chris brought me flowers, we had dinner with his mom, and I had some time to relax. I also took on a big house tidying/re-org project over the weekend, which was nice to do without the kids here. My house was built in the 80s, so like a lot of houses in its era, it has a separate living room and den. The living room is kind of the “grown-up room,” and the den has been designated as the kids’ playroom. Mainly because I think it’s ugly. It’s got dark green carpet and wooden beams along the ceiling, and I just think it looks dated and old. There’s a lot of updates I’d love to do (new carpet, painting), but it’s a rental house, so I can’t. Looks like a damn Toys R Us exploded in my house. It’s just… not very inviting. Since the kids were gone, and it’s so much easier to do these things when they aren’t around, I cleaned out a whole bunch of toys they don’t play with anymore. (If the girls are here, I can’t get rid of anything because suddenly toys they haven’t touched in two years become their most precious belonging, and there are wails of, “…but I LOVE that!” It drives me crazy.) So I’ve stashed away 4 hefty bags of toys, and my rule is that the things they notice are missing and ask for will be returned, but everything else goes to Goodwill in 6 months. I’m betting they won’t notice or miss 99% of it. I also bought a small bookcase to organize some of their smaller bins, and hung up some curtains, and boom. And yes, I know the kids will trash all my hard work within 20 minutes of their arrival home tonight, but for now, I’m really enjoying it. I also cleaned out a whole bunch of other stuff, which I didn’t take before-and-after pictures of, so you’ll just have to take my word for it that it looks a lot better. And it felt like a really great Mother’s Day gift to myself, to have a tidy house. And as much as I really didn’t mind not having the kids yesterday, because it was so nice to have the weekend off, I’m also really excited for the girls to come home tonight, so I can get all the extra hugs and kisses I didn’t get yesterday. This entry was posted in Cate, House Stuff, Lucy, Single Parenting by Cindy. Bookmark the permalink.